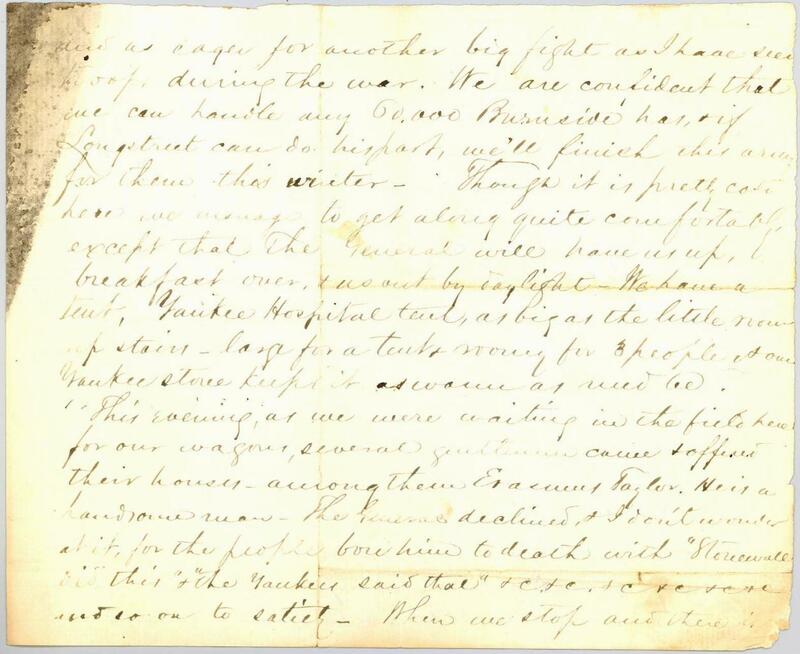 Item description: Letter, 28 November 1862, from Alexander Swift (“Sandie”) Pendleton, officer on the staff of Stonewall Jackson, Second Corps, Army of Northern Virginia, to his father Gen. William N. Pendleton. Item citation: From folder 29 of the William Nelson Pendleton Papers, #1466, Southern Historical Collection, The Wilson Library, University of North Carolina at Chapel Hill. Hd. Qr. 2d Corps Army No. Va. Marching everyday has brought us from Winchester thus far on our way towards Fredericksburg the great battle expected by everybody, but those in the secrets, of whom I am not one. And so you may perhaps get my next letter dated near Fredericksburg. What the news of the army down there is, I have not the faintest idea. But the Richmond paper of today, which has reached us in this land of civilization, reports all quiet and Burnside actually moving part of his force round to Suffolk. If so, he is as sure to be whipped, & that speedily & badly as that we are here, and ready for our old tramps to the rear. Our corps musters 30,000 men for duty – in as fine time and as eager for another big fight as I have seen troops during the war. We are confident that we can handle any 60,000 Burnside has, or if Longstreet can do his part, we’ll finish this army for them this winter. Though it is pretty cold here we manage to get along quite comfortably, except that the General will have us up, breakfast over, & us out by daylight. We have a tent, Yankee Hospital tent, as big as the little room upstairs – large for a tent & roomy for 3 people & our Yankee stove keeps it as warm as need be. This evening, as we were waiting in the field here for our wagons, several gentlemen came & offered their houses – among them Erasmus Taylor. He is a handsome man – the General declined, & I don’t wonder at it, for the people bore him to death with “Stonewall did this” & “the Yankees said that” &c, &c, &c. and so on to satiety. When we stop and there is something to write, you shall have a long letter. What of Pa? I have heard nothing from him since he left the valley. Love to all. 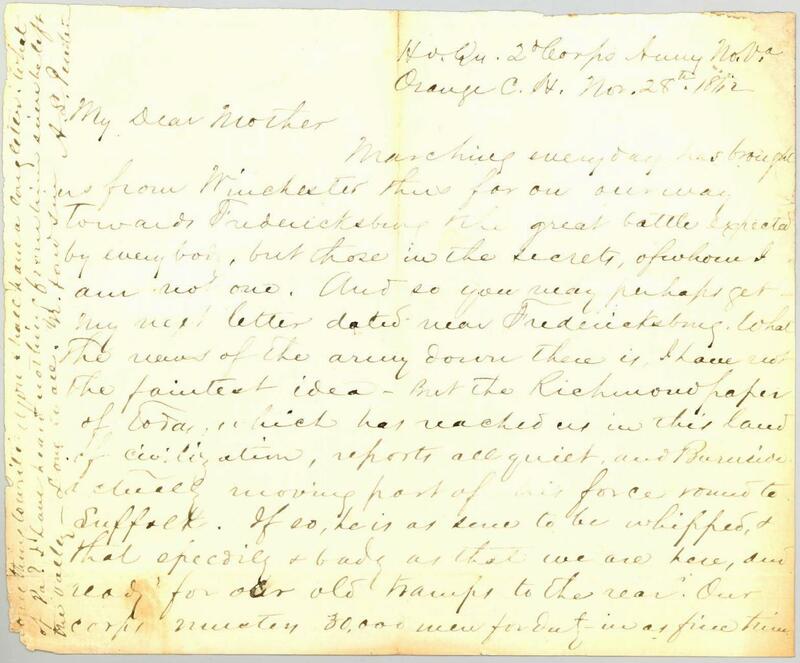 This entry was posted in Southern Historical Collection and tagged Alexander Swift Pendleton, Fredericksburg, General Ambrose Burnside, Second Corps, William Nelson Pendleton. Bookmark the permalink.